What should we do about China? The basic problem is simple: China runs a huge trade surplus — exporting way more stuff to the rest of the world than they import back — and that means the rest of the world runs a huge trade deficit with them. That includes the United States. And for us, the problem is even worse because we also run a big trade deficit with OPEC countries in order to satisfy our boundless thirst for oil. What to do? This is of course unsustainable. The only way that this deficit can be corrected is by reducing the value of the dollar….This decision would mean that the United States could finally get its trade deficit down to a manageable level. 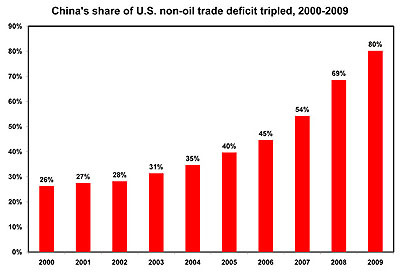 The trade deficit has been the leading imbalance in the U.S. economy over the last decade. The large trade deficit required very low private savings and/or large budget deficits. This is an accounting identity. If the country is a net borrower from abroad (this is what a trade deficit means), then it must have low national savings. There is no way around this story. In reality, China is pointing a water gun at our heads. We should beg them to become unhappy with our fiscal and monetary policies and stop investing in Treasury bonds. The improvement in the trade deficit that will result from the fall in the dollar will create ten times as many jobs as any “jobs bill” that President Obama can possibly get through Congress. Although people don’t always think of it this way, what the Chinese government is doing here is engaging in massive capital export — artificially creating a huge deficit in China’s capital account. It’s able to do this in part because capital controls inhibit offsetting private capital inflows; but the key point is that China has a de facto policy of forcing capital flows out of the country….By creating an artificial capital account deficit, China is, as a matter of arithmetic necessity, creating an artificial current account surplus. And by doing that, it is exporting savings to the rest of the world. ….Notice that I didn’t mention the value of the renminbi at all in this account. It’s there implicitly: a weak renminbi is the mechanism through which China’s capital-export policy gets translated into physical exports of goods. But you want to keep your eye on the ball: it’s the artificial capital exports that are the driving force here. Both posts are worth reading. Krugman and Baker both agree that China’s threat to stop buying U.S. treasuries is not only hollow, it’s something we should actively favor. If they started dumping their U.S. assets, China would lose money on the deal and the dollar would fall in value, which would help correct our trade deficit. What’s not to like?